The eyes have been called the windows to the soul – and for good reason. The iris of the eye contains a wealth of information about a person’s genetic inheritance, general level of physical health, and even their personality. Iridology can help you determine what body systems are likely at the root of people's health problems, what diseases they are genetically prone to and where the body is likely to breakdown under stress. This makes iridology one of the most valuable tools you can use for practicing preventive health care! Iridology can also help you develop stronger connections with others by helping you know the best way to communicate them. For those of you who are unfamiliar with it, iridology is the art and science of examining the colored part of the eye (the iris) to acquire information about a person’s physical, mental and emotional health. 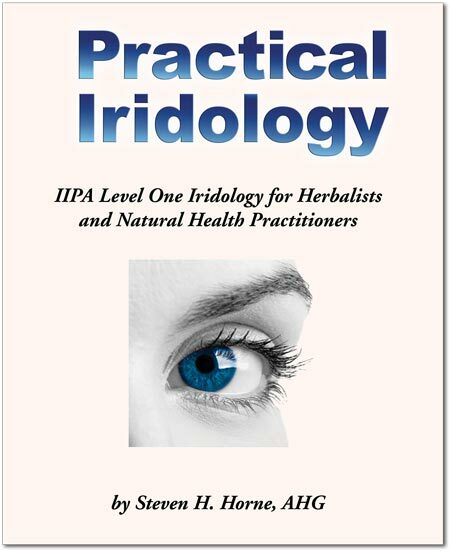 I'm the author, Steven Horne, and Practical Iridology is a course I created for the herbalist, nutritionist and/or natural health practitioner. As a professional iridologist and former member of the Board of Directors of the International Iridology Practitioner’s Association (IIPA), I share IIPA’s goal to elevate the practice of iridology worldwide. I am an IIPA Certified Comprehensive® Iridology Instructor (CCII) and am revising this program so it will qualify as an IIPA Level One course. Practical Iridology features an up to date color manual and additional online materials to make it compliant with requirements for IIPA Certification. Our first class will briefly cover the history of iridology, mentioning some of the pioneers in this field. We'll also cover the actual anatomy of the eye, which helps us understand exactly what we're observing when we look in the eye and make certain that we use correct terms. We'll also cover the fundamental concepts of iridology, such as what the iris can and cannot do, and ways the eyes can or cannot change. We'll also introduce iris maps. In this second class, we will cover the basics of iris topography—positions, zones and "clock." We'll also introduce the major iris signs, including pigments, the various types of lacuna (open, closed, crypts and defect signs), cords, reflexive signs, perifocal lightening and transversals. We'll explain the difference between topostabile and topolabile signs and compare old iridology terms to new iridology terms. In this lesson we will discuss the nature of constitution as a genetic predisposition. We'll consider this from the Disease Tree perspective and the Health Equation, created by Bill Caradonna, co-founder of IIPA. We'll discuss both structural (density and shading) and the three iris color types (Lymphatic, Billiary and Hematogenic). We'll also introduce the subtypes for each of the color types and the basic therapies those types can use to improve their health. In this lesson we'll review the three color constitutions and then go into detail about the constitutional subtypes associated with each of them. These include overacid, febrile, hydrogenoid, uric acid, scurf rim and ferrum chromatose. We'll also look at the lipemic diatheses, which is a corneal sign, not an iris sign. For each of these types we'll look at the health problems typically associated with it and the therapies that can be used to balance the body in each of these situations. In lesson five we'll cover the meaning of various colors (straw yellow, orange, fluorecent orange, brown and tarry black) and pigments in the iris. We'll discuss various heterochromia's (central, partial, hypertrophic and hypotrophic) as well. We'll also review the various types of lacunas (honeycomb, stairstep, torpedo, beak, tulip, shoe, asparagus, leaf, polypose and medusa) along with collarette crypts and neuronal netting. We'll talk about topostabile and topolabile signs for both pigments and lacunas. Lesson six will cover the pupil tonus variations and how they are related to nervous system function. We'll look at factors like pupil size, ellipses and flattenings and what they mean. We'll also examine various aspects of the collarette. We'll consider factors like placement, quality, appearance and shape. We'll again discuss possible therapies for health problems that may be associated with these signs. This lesson will cover the various types of contraction furrows, such as concentric, humoral, intersection, peripheral, sectional opening, sloped and stairstep and what they may indicate. We'll also cover some of the signs seen in the sclera of the eye such as trauma forks, fermentation signs, encapsulations signs, pinguecula and ptergium. We'll also talk about the meaning of various types of blood vessels visible in the sclera, such as indicator, tangetial, meandering, bordered, spiral and netted. Independently of iridologists, Denny Johnson created a system of emotional interpretation of the iris. Since all traditional systems of constitutional typing link physical and personality tendencies, it makes sense that basic genetically-determined personality characteristics would be visible in the eye. So, in this lesson we'll talk about the four basic emotional types, flower, jewel, stream and shaker. We'll also cover introversion and extroversion, right and left brain dominance and the emotional meaning of specific signs and map areas. This topic will be covered in more detail in the Personality Typing and Therapy class in the Certified Emotional Healing Coach program. In lesson's nine and ten we'll put it all together. We'll go through the various body systems and show how to put things together to read the iris as a whole. We'll demonstrate how to move from the general to the specific, ask the right questions and put together programs using the information we gain from the iris. Required For: Certified Iridogist. Completion of the former Practical Iridology course will not count towards this certification as we're adding new material to meet IIPA requirements. One can upgrade from the old course, however. Prerequisites: We recommend taking the free class An Introduction to Iridology before taking this course. Webinar: All classes are recorded and posted online. Course Hours: Ten two-hour webinars with about 30 hours of reading, online activities and homework for a total of about 50 hours of study. This course comes with a 175-page course manual. Course Fee: $320, $50 discount for members of the herbiverse. Course fee includes a one year student membership to IIPA.